The method was developed at the end of the 90’s by Dr. Norbert Egger in Salzburg and is now successfully used in over 50 countries worldwide. The HYPOXI-Method is based on three pillars: alternating pressure, moderate kinetic training and balanced nutrition. The HYPOXI-Method has a unique effect on typical female, but also male problem areas. It acts in a completely natural way: Undesired fat deposits are reduced from the stomach, hips, buttocks and thighs by using the natural principles of lipid metabolism. At the same time, the HYPOXI-Training continually strengthens the connective tissue and firms the skin so that the unpleasant appearance of cellulite is clearly improved. 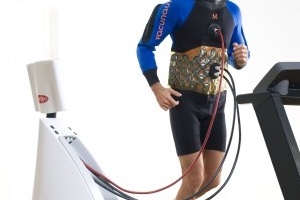 The combination of innovative devices and the individual supervision by a HYPOXI-Coach makes this method unique. With HYPOXI your “dream figure” becomes real. Effective and long-lasting. Interested? Then find a HYPOXI studio near you and start now! The concerned parts of the body are exposed to targeted gentle pressure. The alternating pressure by use of vacuum and compression, as per the principle of cupping, stimulates the affected tissue and the blood circulation is intensified.Throughout the HYPOXI-Training the alternating pressure is exactly were your fat deposits lie dormant. Smooth ergometer-training gets the fat metabolism going. This is an indispensable precondition so that redundant fat is activated and transported via the blood circulation to be burned in the muscles. Another good news: With HYPOXI there are no strict starvation diets or unilateral diets. After the metabolic analysis, the HYPOXI-Coach in your studio develops together with you a nutrition plan which is easy to follow and provides optimum support to reach your target achievement. It is individually tailored to the needs of your body and protects you from the infamous Yo-Yo effect.